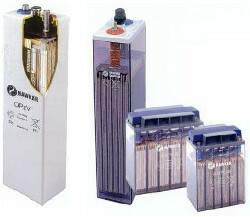 The lead acid battery is the standard of reference for stand alone applications. According to the conditions of use, we offer Valve Regulated Lead Acid batteries (Absorbed or gelled electrolyte) or Open Vented Lead Acid batteries. For indoor storage, we propose wooden stand or metal (for sealed batteries only). Stand outdoor storage, we propose polyethylene enclosures.